Grace Christian College is a Born Again Christian school, formerly known as Grace Christian High School. The school caters primarily to Chinese-Filipino students and provides education from Pre-Nursery to College. It is situated in Grace Village, Quezon City, Metro Manila, Philippines. Its current president is Dr. James L. Tan. The current dean is Dr. Zenaida Lumba. The school was founded July 5, 1950 at Nagtahan Street in San Miguel, Manila by Baptist missionaries Dr. and Mrs. Edwin G. Spahr and educator Mrs. Julia L. Tan. 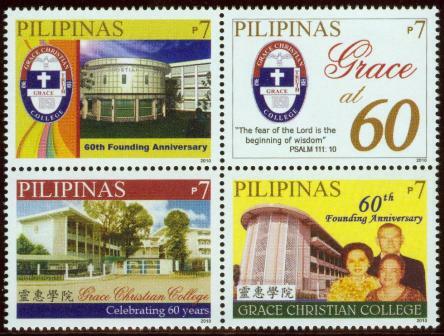 In 1966, the school moved to its current location in Grace Village, Quezon City, to accommodate an increasing student population. Inauguration for the new campus was held on August 2, 1966. The school has an administration building, a four-story high school wing, a four-story elementary building, a 4-story college wing, a kindergarten complex, and various related educational facilities. The school uses the Grace Christian Church’s facility, with a seating capacity of 1,500, for its religious assemblies. In June 2008, the school opened the new Grace Christian College. The plan of having a college started over 20 years ago with one of the school’s founder Mrs. Julia L. Tan. The college offers the following courses: B.S. Accountancy; B.S. Business Administration; B.S. Electronics and Communications Engineering; B.S. Information Technology; B.S. Secondary Education Majors: English and Mathematics. Academic Programs offered: A.B. English; B.S. Biology; B.S. Psychology; B.S. Math; B Elementary Education.